In the spirit of April being National Poetry Month, I've decided to enter a brief essay every day on one of my favorite poems in the hopes that I'll be able to share some beautiful, important pieces of art with the people who are beautiful and important to me. After a few years hiatus, I'm finally making my way back into poetry appreciation and analysis. Critical Point Theatre, http://www.criticalpointtheatre.com/, was generous enough to offer me a spot in their rotation of podcasts under their new podcast wing. 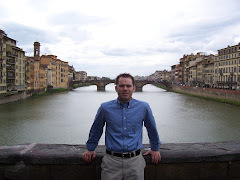 It probably helps that the Head Honcho of Podcasts for Critical Point (that is the official title for the position) is my brother, Andrew Kaberline. If you've stumbled upon We Convince By Our Presence and enjoyed some of the written content now or in past years, then I encourage you to swing by Critical Point Theatre's podcast wing, https://theatrecpt.wordpress.com/category/heres-the-word-2/. There you'll find a number of wonderful podcasts worth your time, including Here's The Word with me, Matt Kaberline, as the host. The first episode focuses on Oranges by Gary Soto. Episode two, which delves into Naomi Shihab Nye's poem Famous, should be posted sometime this week. And future episodes will feature poems I've written about on this blog in past years, as well as brand new poems. 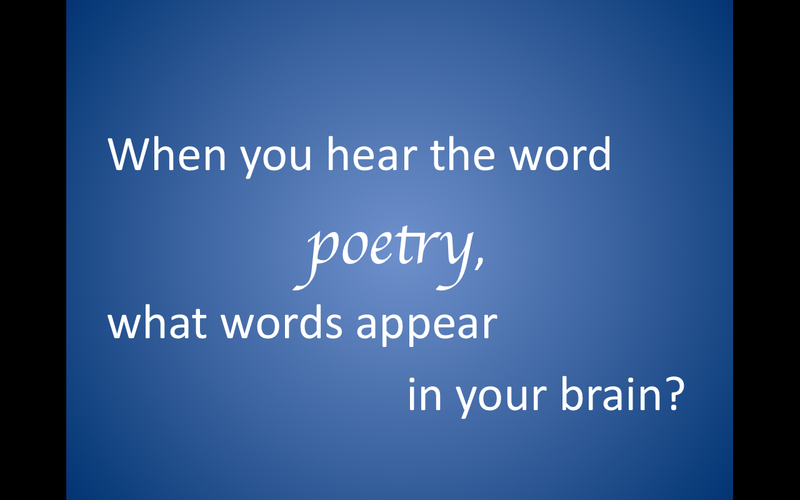 Poetry… So much can be accomplished with a single word. Some of you just heard that word that begins with a p and shivers traveled down your spine at the speed of light. You had flashbacks to high school and the English teacher who repeatedly asked, “but what does the poem mean?” as if it was a rubik cube and you could somehow twist your way to a solution, to a meaning. Others heard poetry and got all warm and fuzzy inside. You were read Dr. Seuss from an early age. Shakespearean sonnets are your thing. A boyfriend gave you a book of Neruda’s poems and read them to you, maybe in bed. You were Emily Dickinson in another life. You would subject yourself to driving through a tropical storm just to hear Billy Collins read his newest collection of laugh-out-loud reflections or Mary Oliver cradle you with her words as she lulls you into nature. And then there is you, the intended reader of this blog post and the intended listener of our new program, Here’s The Word. For you, poetry doesn’t incite PTSD, but it also is not likely to immerse you in joy…yet. You see, that’s where we come in. We are determined to make poetry a little more fun for all of us. It’s been tried before, in fact every modern Poet Laureate has been tasked with helping poetry become more accessible to the non-poetry reader. It’s not that these efforts have failed, but we figured that any effort to bring poetry to the masses is a noble pursuit, so we decided to throw our hats in the ring. For your listening enjoyment, we present Here’s The Word, a fresh take on poetry, featuring poems from near and far, old and new, on all sorts of topics, written by all sorts of poets. While the structure of the program will remain relatively stable, the content will vary greatly, all with the goal of introducing you to poetry that you should read. 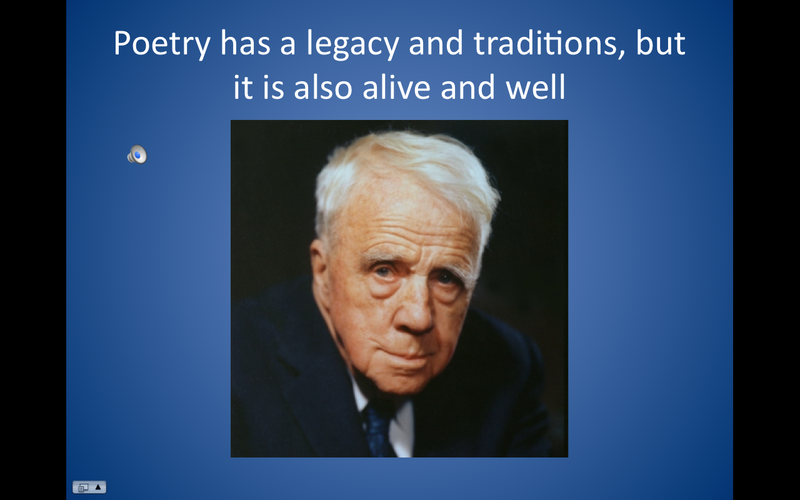 Why poetry? 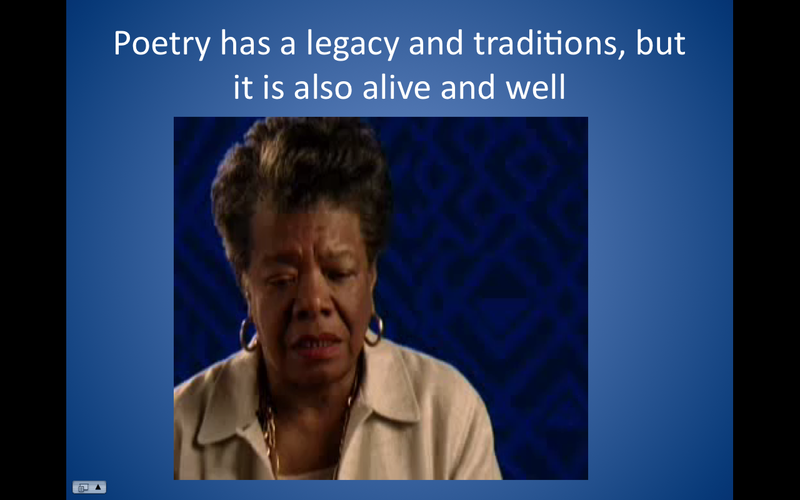 For thousands of years we have written, read, spoken, and listened to poetry. Stories were told legends were shared, news was passed along, lives were celebrated, loves were sealed, and histories of whole peoples were disseminated through poetry. 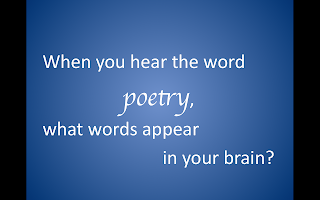 Poetry remains an essential means of communicating the human condition in all its intricacies and various stages. Wallace Stevens once observed that, “the purpose of poetry is to contribute to man’s happiness.” When we sing a drinking song in a pub with friends or ramble our way through a favorite nursery rhyme with our kids, we are using poetry to stoke our own happiness. Salman Rushdie’s view on poetry veers in the opposite direction; he notes that “a poet’s work is to name the unnamable, to point at frauds, to take sides, start arguments, shape the world, and stop it going to sleep.” Through Rushdie’s lens, poets are responsible for keeping the world vigilantly aware of conflicts and appropriately weighed down by the scales of justice. Both of these writers are correct in their assessments, and because they are both correct we can see the diverse beauty of poetry. It’s an all-encompassing form that allows the silly and the serious to exist together, peacefully, in the same world. This is the world we will explore, with you as our guest and co-pilot, on Here’s The Word. ---Billy Collins. “Introduction to Poetry” from The Apple That Astonished Paris. Copyright � 1988, 1996 by Billy Collins. 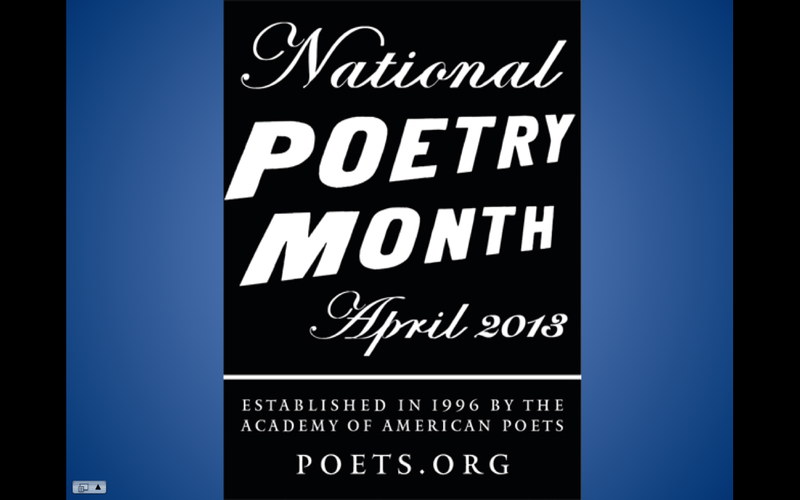 Earlier this past spring, I gave a National Poetry Month Presentation to the whole student body (high school) at the school I teach and counsel at. I figured that I might as well share parts of the presentation here. After a front page and introductory slide or two, we launched into the important question you see above. I've asked this question of college seniors, kindergartners, and students of all ages and grades in between. Unfortunately, the answers often indicate that poetry is a chore. 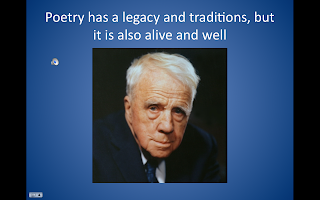 Many students have a negative association with poetry in the way it was first taught and presented to them at a young age. So I collected some of the answers I've heard and put them in a wordle. 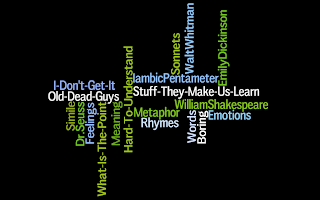 iambic pentameter), there are forms (sonnets), there are famous poets (Whitman, Dickinson, Shakespeare), and of course there are emotional reactions (boring, hard-to-understand, I-don't-get-it). Sure, these are valid replies. But I don't think they help me driving home my point: poetry is accessible! We make it inaccessible, whether we are scared off by it at a young age, or because we scare ourselves off from it by feeling like we have to discover a poem's ever elusive "point." So how did I turn the tables on the students? I asked them the same question I asked about poetry, but this time I asked it about music (When you hear the word music, what words and images appear in your brain?). Hands shot up, minds churned, ideas were shared. This was exactly what I wanted. 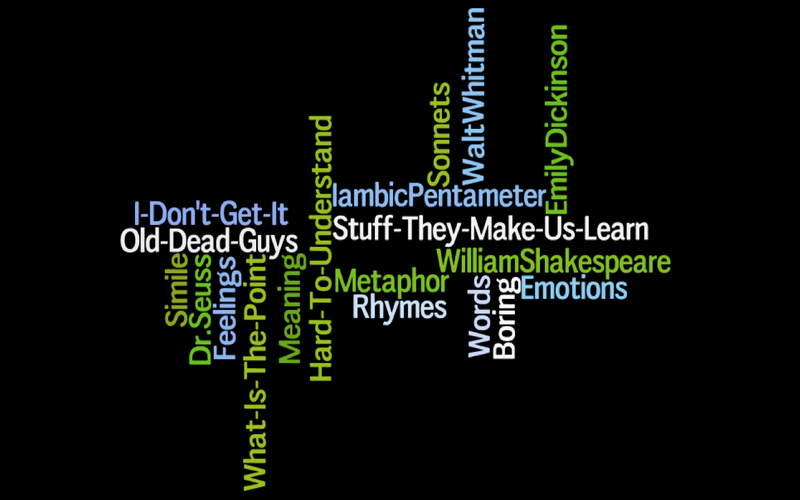 I showed the wordle responses on the poetry question again. I told the students, think about the answers they just came up with for music (Rap, Grunge, Drake, Rihanna, MTV, Palladia, radio stations, and lots of types of dances). The answers on the poetry wordle would be the equivalent of Bach, Gregorian Chant, Oboes, and Elevator Music to the same music question. We need to give poetry a chance, starting with the poetry that is written today, otherwise we are focusing on the history of poetry, as opposed to its vibrant and dynamic present. 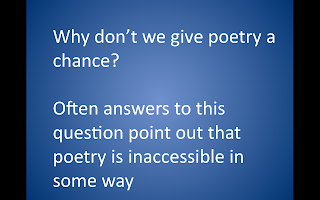 There are many reasons we don't give poetry a chance: disinterest, lazy, fearful, too busy, thinks it's only for smart people, feels it's not accessible. 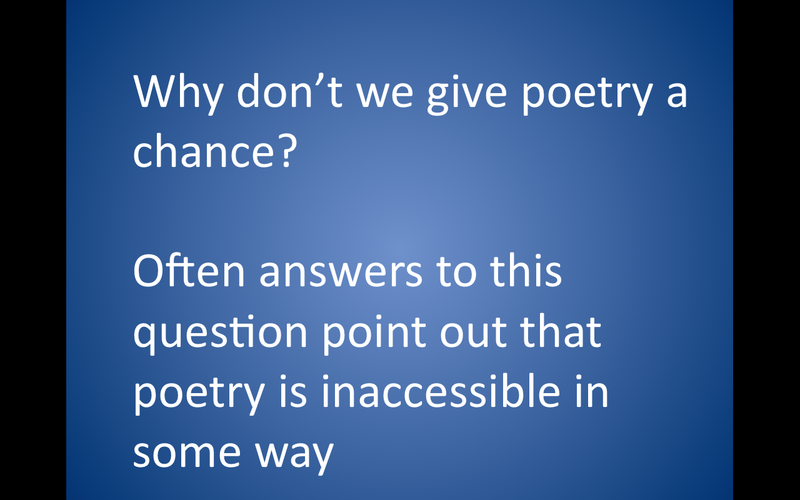 So the question then becomes, how do we make poetry accessible? This is certainly a larger and longer discussion that I couldn't have with the whole school (I'd love to revamp some of the ways that poetry is presented in elementary and middle school). Instead, I focused on what I could control---why not urge all students to buy/rent a single book of poetry. I asked the audience to raise their hands to the question of how many of you have a television in your house? Some of them have multiple televisions in their home. I then asked them to keep their hands up in they have a book of poetry in their house. The hands rapidly dwindled. I finally asked how many of you have a book of poetry written in the last fifteen years. The remaining raised hands were few, but proudly shooting up to signify their attachment to poetry. It was now time to turn to some examples of poetry in the form of audio and video clips of poetry. I started with Frost (audio), then moved on to Angelou (video), and ended with some spoken word from Lemon Andersen by way of Reg E Gaines (video performance). The idea was to show a progression of poetry, a natural movement through the last century that continues with what is being written and performed today, including anything these students in the audience might contribute. The presentation ended with some specific opportunities to get move involved in poetry at our school and in our local community. In my allotted 12 to 15 minutes, I tried to pack in as much as possible to get students (and faculty) thinking deeply about poetry and their own personal relationship (or lack thereof) with poetry. We've reached my favorite time of the year! The first two days of the NCAA tournament induce the same pristine excitement, anticipation, and joy as Christmas eve and morning did during my childhood. How can you not love a bracket full of teams, all with dreams of their one shining moment. As of 12:15 pm yesterday, every team (minus the new-fangled play-in game participants) had a chance to win. The smallest schools rising to the national stage for the very first time. The largest powerhouses with arenas on their campuses full of banners symbolizing their past successes. And the in-betweeners, the schools who have won a game or two, made a run through the tournament that galvanized their fans into believing it could be their year, only to lose shortly after in some heartbreaking or, even worse, boneheaded fashion. There is a certain beauty to March Madness; the way that team members sacrifice all of their own ego and importance for a shot at victory, the way seniors respect the game and their final moments in it, and the way underdogs come to believe they can take down the Goliaths of the world (especially when a partial crowd rallies behind them). The men in B.H. Fairchild's Old Men Playing Basketball don't strike me as veterans of the NCAA tournament. Certainly they've watched many of the classic match ups and plays, just not from a bench location or on-court vista; no, they've been in the comfort of a bar, their own couch, or possibly in the cheap seats at the top of the stadium. Still, they carry the same respect for the game of basketball that makes March Madness a yearly phenomenon. The game of basketball, at a certain point, exposes all of our flaws, wrinkles, and inequities. Most short guys will never know the surge of power that comes with dunking a ball. Most old guys will never again feel the curtain of bravado drape over them after a reverse, 360 layup. And most former players will continue to carry an image in their brain of what they were, not what they have become. This is the point that B.H. Fairchild illustrates in his wonderful poem. Even if the game exposes who we are, when all we want to is return to being who we were, there is still a familiar beauty in revisiting the past in our present forms. "In love / again with the pure geometry of curves," these men recover some part of themselves in the movements and mannerisms of their youth. They may be "heavy bodies" now only capable of "the grind of bone and socket," but the nostalgia soaks over them and stirringly permeates the current versions of themselves. Fairchild wonders if they still make love to their wives with the same artistic and majestic moves of their youth, if they still sing their silly songs on the walk home, if they are still equipped with the aura of opportunity and possibility when they cuddled with their girls "in the Chevy's front seat" under the "light of the outdoor movie." The moments of our past are never lost, as long as we have triggers that breathe life into them in our present. For many men and women, basketball is one of those triggers. It will be a lifelong trigger for all those March heroes on TV over the next few weeks. It is a lifelong trigger for Danny Ainge, Tyus Edny, Christian Laettner, and all the fans who cheered and cried as they had their game winning turns. It is a lifelong trigger for the Butlers, George Masons, and VCUs of the world, as much as it is for the Duke, North Carolina, and Kentucky. Why is basketball a trigger that sparks the feelings and skills of the past into our present selves? I'm not exactly sure, but I think it has something to do with the magic of nostalgia. Magic might be the key word. Look no further than the final stanza of Fairchild's poem and you'll find magic: "A glass wand / of autumn light breaks over the backboard. / Boys rise up in old men, wings begin to sprout / at their backs. The ball turns in the darkening air." Here's to boys rising up in old men, here's to girls rising up in old women, here's to basketball. After a great four year run of Aprils filled with favorite poems and corresponding essays, I'm taking a year off. I wish this wasn't the case, but sometimes life's complications have a way of interrupting the best laid plans. I have every intention of continuing with the blog next year. 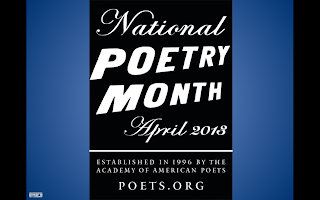 In fact, I'm exploring the option of converting the blog from an annual National Poetry Month format to two featured posts a month throughout the year. This type of change would allow me to deliver the same volume of content, but in a spaced out manner, which is far more conducive to a person with a busy schedule. Keep your eyes peeled for updates on when this new format will roll out. Thank you for your continued support, comments, interactions, and readership! We've reached the end of another April. I've tried desperately to keep up as I've posted a new poem or poetry related feature every day this month, but life has gotten in the way a few times. Still, I hope you've enjoyed the new poems, found something fresh in the old poems, and taken insights and questions away from We Convince By Our Presence this year. It is my intention to continue on a for a fifth year in 2012. I will occasionally post new content (probably more of these movie versions of poems) throughout the year. As always, your comments and ideas are greatly appreciated. 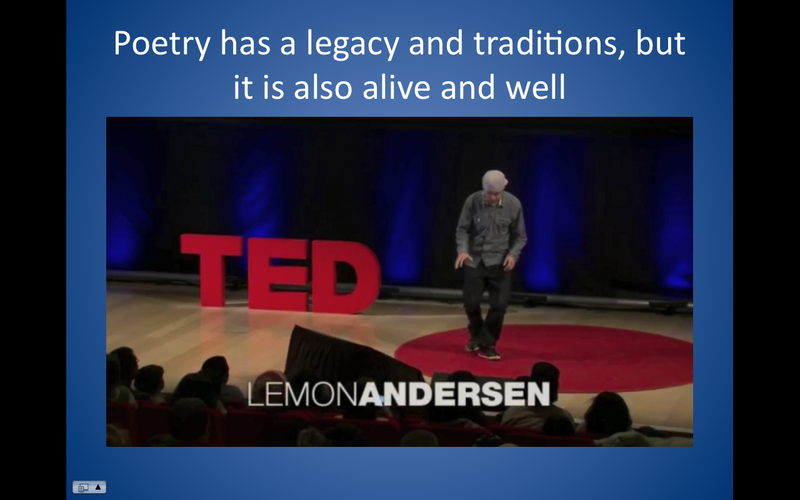 Here's to the many ways that poetry makes our lives better! I, like the other 7 billion people on earth right now, have moments where life dazzles and delights me, where I'm in awe of everywhere, everything, and everyone around me. These are the moments I live for...but these moments are special because they are rare. They naturally arise without expectation or anticipation and they just as naturally recede into the minutiae of routines and normal daily life. After reading William Stafford's poem You Reading This, Be Ready, I noticed that the greatest trait we, as human beings, can possess just might be contentment. To be content, truly content, requires a sense of awareness, purpose, and focus that for most people is unattainable. Contentment is hard work! You have to assess your life and the metrics of the world with the most honest vision. This quest takes us into our greatest desires, hopes, and dreams, and while these possibilities can be invigorating the honesty part is certainly a buzz kill. For example, contentment means accepting that because I'm 5 feet 8 inches tall there is very little chance that I'll ever play power forward for the Chicago Bulls. Coming to grips with this realization and other far more traumatic ones is the hard work of finding contentment. The grind continues when you take stock of the good in your life, because conversely you must consider the horrors you've avoided. I might have gripes about my apartment, my car, and my job, but at least I haven't weathered the atrocities of civil war, battled against malaria without proper medicine, or suffered through tsunamis and hurricanes that wiped all I'd accumulated in this world to the bottom of the ocean. I'll repeat it because it bears repeating: contentment is hard work. So what is the payoff? If you asked William Stafford that question I'd bet that this poem would be his answer. Contentment is "sunlight...along a shining floor" and "the breathing respect that you carry wherever you go right now." Contentment is the peace that Stafford implores us to hold onto, the peace that he wants to breathe through us and fortify our souls. It is fresh and new, it is sparkling and joyous, and because it is these things and so much more, Stafford's words should stay with us: "carry into evening all that you want from this day. This interval you spent reading or hearing this, keep it for life." It would be easy to let this calm cover your surface and because it is easy most people will ingest it in this way. But remember, contentment is difficult, even the pay off is difficult. The payoff, if you accept the challenge, will overwhelm you. The payoff happens when no one is looking "when you turn around." I say all of these things as if I'm an expert, but I've just as guilty of the surface contentment as the next guy or gal. Maybe I should take up the hard work of contentment, maybe it's time to ask Stafford's question: "Starting here, what do you want to remember?"